This vanity is a great way to add traditional style to your bathroom. Its beautiful white marble counter and brown solid wood base bring a great new look into your bathroom. Put a classic feel in your bathroom with this good-looking set from Wyndham Collection. This vanity has both an all-around look and a modern style. Its comes with a nice white marble counter and brown solid wood base for strength and style. Redo the style of your bathroom with this classic from Wyndham Collection. Sheffield 72-inch W 5-Drawer 4-Door Vanity in Brown With Marble Top in White, 2 Basins With Mirror This vanity is a great way to add traditional style to your bathroom. Its beautiful white marble counter and brown solid wood base bring a great new look into your bathroom. Put a classic feel in your bathroom with this good-looking set from Wyndham Collection. 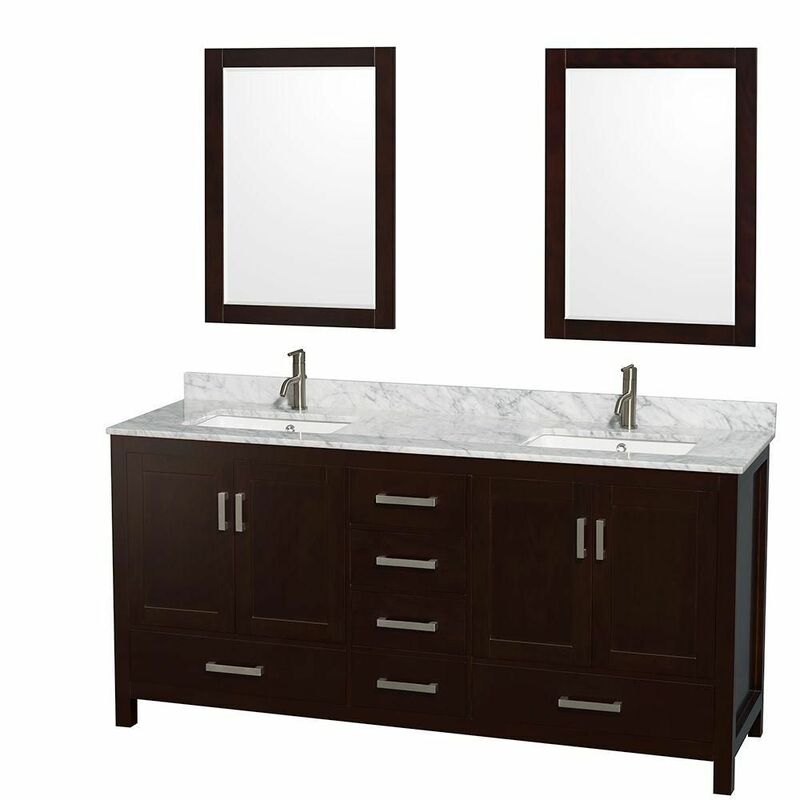 Sheffield 72-inch W 5-Drawer 4-Door Vanity in Brown With Marble Top in White, 2 Basins With Mirror is rated 4.2 out of 5 by 34. Rated 5 out of 5 by HomeDepotCustomer from Excellent quality , all wood cabinetry except the drawers .... Excellent quality , all wood cabinetry except the drawers . Rated 5 out of 5 by ID from The vanity and mirrors are beautiful in my renovated bathroom! Really great quality and love the ... The vanity and mirrors are beautiful in my renovated bathroom! Really great quality and love the soft close doors too. The counter top is gorgeous too! Everything came packaged very well too, would definitely recommend! Rated 4 out of 5 by DoogieSF from The cabinet is solidly built, and arrived exactly as described. The marble top arrived broken, al... The cabinet is solidly built, and arrived exactly as described. The marble top arrived broken, although Home Depot made it good and provided an entirely new unit. One of the drawers wouldn't close all the way on its own (soft close) until we tweaked it just slightly by pulling up on a corner. Now it works just fine. Rated 5 out of 5 by Dennie from While shopping the HOUZZ website for a 6 ft. Bathroom Vanity, I found what I was looking for from... While shopping the HOUZZ website for a 6 ft. Bathroom Vanity, I found what I was looking for from several sellers. I decided to check Home Depot's website and was pleasantly surprised to find the same item I wanted for a better price! (plus free shipping!) I don't do a lot of on-line shopping, so it was a pretty big deal for me to order a piece of furniture and matching mirror to be shipped from CA (I live in TN). It was packaged very well and everything was metal banded and shrink-wrapped to a wooded pallet. It sat in my basement garage for two+ months while my bathroom was being demolished and re-built. I was so excited when I unwrapped it all - it arrived in perfect condition. It's everything I had hoped for. I like the new higher height of bathroom vanities these days, it has more drawer space than my former 6 ft. single-sink vanity (great use of storage space), I like the color (Espresso) and the auto/magnet door/drawer closures are nice. I was THRILLED to find a vanity with a MATCHING MIRROR (one less decision to make). I officially "moved" into the new bathroom and vanity this weekend. I'm very pleased - it's definitely meeting my expectations! Thank you. Rated 5 out of 5 by TDavis from Beautiful cabinet made extremely well perfect for my bathroom makeover.... Beautiful cabinet made extremely well perfect for my bathroom makeover. No complaints.